In all decent sized cities, at least in America, you’ll find a holistic community. And if you’re lucky, nestled within this community will be a meditation studio. In this article, I will share tips based on my years of experience as a meditation studio owner and operator. If you have a burning desire to be of help to those plagued by busy and chaotic minds, teaching meditation may just be your thing. Those who have a passion to help bring healing to others at some point have to face the challenging moment of making a go of it. If you are a solo practitioner, it is often best to maintain a more traditional job to ensure you can pay your bills and then begin to develop a client base over time. Eventually it may make sense to rent office space and make it a full time profession. When it comes to opening a meditation studio, you likely won’t be able to ramp up in this way. The main reason is that the physical location is one of the most important aspects of success. 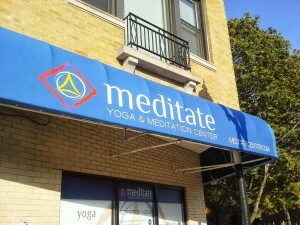 Above all, you’ll need a location that is conducive to deep meditation. Finding a quiet space might be a big challenge. To clarify, the entire space doesn’t have to be utterly still but mostly just the rooms in which meditation will take place. At the same time, as all successful business owners know, the location of your business is crucial. It’s not that hard to find a space in a remote area where you can maintain a quiet atmosphere. The problem is getting customers to your place if it’s too isolated. As mentioned above, a meditation studio needs to be quiet. Discovering the noise levels within a commercial space is not that easy. You will likely find out over the first 60 days what kinds of noises you’re in store for. There may be residential units above your commercial space and while hanging out during the weekday, all seems fine. However late afternoon or evening classes are generally important so working people can attend. Be aware of people making noise upon returning from work, especially if the apartments above you have wood floors. In my first meditation studio, I found I had upstairs occupants that never took their shoes off. Their arrival home from work always seemed to coincide exactly to my class start times. It was very frustrating because I didn’t feel I could ask people not to walk around in their own home! Luckily I was able to rent the apartment directly aboce my meditation studio once the tenants moved out. It added significant cost to my overhead but I had faith I could sublet the unit to someone who was sympathetic to my needs. And in fact, for most of the time when I had the lease, I had paying tenants who were considerate and took their shoes off once at home. In addition to noise, you’ll need good control over temperature and lighting. This may entail installing your own lights with dimmers which will likely require a licensed electrician. It can make a huge difference if you are able to create a mood that is conducive to deep relaxation. When it comes to temperature, finding a good middle ground is key. You’ll find clients who like the room cool such as 67 degrees (yikes!) while others will be bundling up with sweaters in that temperature. I found that a setting between 72 – 74 all year round was mostly accepted by everyone. Sometimes a full room of bodies heated up beyond 74 and people commented it was stuffy. I agreed but it’s hard to please everyone all the time. The main thing is that your meditation studio allows you to manage the thermostat. In Chicago where I started, a lot of residential apartments DON’T allow tenants to adjust their heat. The heating is included in their rent which is attractive to budget shoppers. But for a business like a meditation studio or center, this won’t do. You’ll need full access. Perhaps you’re getting the sense since I have dedicated so much of this article to the physical space how important it is. It is huge! Meditation is such a personal experience and people can be quite finicky. In order for them to relax and have positive experiences, they have to feel really comfortable. Sound (or lack thereof), good lighting and the right temperature will cover about 80% of this. The remaining 20% will really be beyond your control. That’s the chunk that they deal with on the inside. In other words, no matter how perfect your space is, you won’t be able to control it if someone is irritated that day and their mind won’t settle down. Or you might find someone in the class who breathes really loud or worse, falls asleep and snores. These things have all happened and they can be awkward. You’ll need a plan for how to deal. The classes you offer, the teachers who lead the classes, the times that are best for people… these are also significant challenges that require thoughtfulness and planning. You might have a great class but if you schedule it at a bad time, no one will come. Same can be true of a meditation teacher. If the sound of their voice bothers people, it hardly matters what they say. People will tell you it was amazing but then never come back. And sometimes they might go ahead and post a crummy review to boot. Developing an attractive curriculum can be learned by reviewing websites and talking to other successful meditation studio owners. Generally you’ll find a receptive person if you approach in a disarming and humble way. Most business owners have felt the sting to their pride and ego en route to finding success. What I mean is that we go in with a lot of enthusiasm and confidence. You kind of have to bolster yourself in order to overcome the fear that you are about to cost yourself a ton of cash. But a few months into it, it can seem like you are constantly shoveling money into the abyss, buying more print ads, or online ad campaigns, succumbing to an SEO expert who claims to be able to improve your rankings, offering promo events, free classes, Groupon and relentlessly traveling around our city trying to get the word out. A lot of people are so supportive and tell you how cool it is that you’ve opened a meditation studio and then never ever come to a single class. It can be incredibly frustrating trying to figure out what it will take to get a consistent client base. Unfortunately the buying public is fickle and slow to respond. Time will reveal if in fact you have created something of value and this very fact requires a thick skin and patience. Let’s assume you have found a great location and calculated that the build-out needed (the amount of construction to make it look like an amazing meditation studio) is affordable. You’ve constructed good meditation rooms (or just a single room which was sufficient for me), created a welcoming reception area and even have change rooms. Your restrooms are clean and tastefully decorated. You’ve chosen a soothing color palette of paint shades for the walls as well as finding all the subtle little decorating touches throughout to give it just the right ambiance. Believe me, this part is very important. Don’t scrimp on ambiance. You’ll want clients to walk in and feel something good right away. The next step involves communicating your existence to the people. Make no mistake folks, this is a business and as such you need a consistent flow of revenue or else you’ll be counting down the months until you shut her down and have to mourn the loss of your baby. It can definitely feel that way. It cost me over $50K to get my first place open with the buildout, the city fees and permits, the website, the awnings and all the gear I needed to make the place look cool. Luckily I had the capitol, and I had a really good full time job, AND I had a super cool boss at that job. I was able to avoid borrowing money and still maintain a good income as I got the studio ready. The next most important thing after the location, the look and feel of the place, the teachers and the classes is the website. These days a website is like a preview to your business. People will make a lot of conclusions about your studio just by looking over your website. Pay for a stylish flexible and functional website. It’s crucial. As well, even a great website means little if it isn’t optimized to be found in search. I mean, these principles apply in all businesses so nothing really revolutionary. But figuring out how people are searching for meditation classes and whatever else you are offering in your particular city will require research. These days, search engines like Google and Bing are constantly changing their algorithms which means like it or not, you need some technical skill to keep your website in their good favors. I had my site built in WordPress which is a very user friendly Content Management System. When I opened my second meditation studio in Charleston, I had to review all the content on my site to remove the Chicago geo-targeted content and add Charleston geo-targeted content. In so doing, I found a ton of issues with my site. In fact I had a marketing firm almost convince me to scrap this website all together and start fresh since it was so riddled with technical errors. Instead I began my own personal quest to understand SEO in 2018. It was amazing and frustrating and quite labor intensive. However theses days, between online articles and YouTube videos, you can easily find good guidance to any website issue. Then you just need the guts to try which also means tinkering with your website code. It can get real fun when you watch your website rankings improve because of technical changes you have made yourself. I personally find learning coding even in this limited capacity to be extremely engaging. It is a nice value-added skill as an entrepreneur. Knowing any skills that improve your web presence are going to be huge assets into the future. Conclusion – Is it worth it to run a meditation studio? Here is where I will tell you honestly. If you’ve made it all the way to this point in the article, you deserve to know. Personally I don’t think running a meditation center is a big money maker. My first studio in Chicago, once I ironed out the kinks and found a good curriculum, paid me what I call a ‘living wage’. I was able to draw an ok salary month after month and only once did I have to reinvest money back in during a bad month. Summers can be tough because people are juggling vacations, kids out of school and just a natural desire to be outside. By the end when I decided to close up and move to the South, I was able to recoup about 80% of my start up funds meaning I withdrew that cash back into my bank account. So I had been paying myself each month and thus getting a ‘steady paycheck’ which I considered return on my investment, plus I recouped most of my investment. In other words, the business succeeded. But let me be clear as well… the job I left to run the meditation studio paid me easily 3X what I made as the studio owner. I didn’t mind. Once I adjusted to the uncertainty of running a ‘storefront business’ with the various headaches and the rewards, I realized the money was secondary. I loved being so engaged in my life and connecting deeply with so many people. I hadn’t anticipated it however one thing I discovered was that many people wanted some private counseling as they explored meditation. This became a steady revenue source as well and something I found tremendously rewarding. My Point? Be flexible. The business will reveal itself in time and may not be what you expected. When I came to Charleston, I had 4 years of wisdom working for me. I was able to find a location that avoided some of the issues in Chicago like noisy upstairs tenants. I had a website and I knew what my curriculum would be. This allowed me to open up at a fraction of the start up budget of my first place. In the end, it’s a risk and it is hard work. You might fail and lose thousands of dollars. Any new business faces that. And you might do everything right but your timing might be off or your location just a little too out of the way. It’s hard to say but I do think it is worth it since you can feel real good about the work you doi each day. Teaching people to meditate can only help our communities! Contact Andrew Shykofsky if you’d like any help opening your meditation studio.